Mar. 26, 2017. 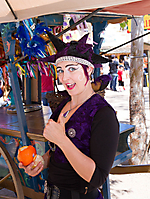 Revisited The Arizona Renaissance Festival the week before the final festival weekend. The festival is a medieval amusement park, a 13-stage theater, a 30-acre circus, an arts and crafts fair, a jousting tournament and a feast - all rolled into one non-stop, day-long family adventure! The Arizona Renaissance Festival brings to life the language, science, arts, engineering, and overall ambiance of the 16th Century village marketplace. "Huzzah!" It runs Saturdays and Sundays until April 2, 2017.